Dawn view of the capitol dome of the white house. Havana Cuba casa de particular. “What would make you feel our trip to Cuba was worth it?” I asked Wayne, knowing it was not only an illegal detour, it was an expensive one. “Rum drinks and dancing in the New Year with you, on the streets of Havana,” replied my romantic husband. 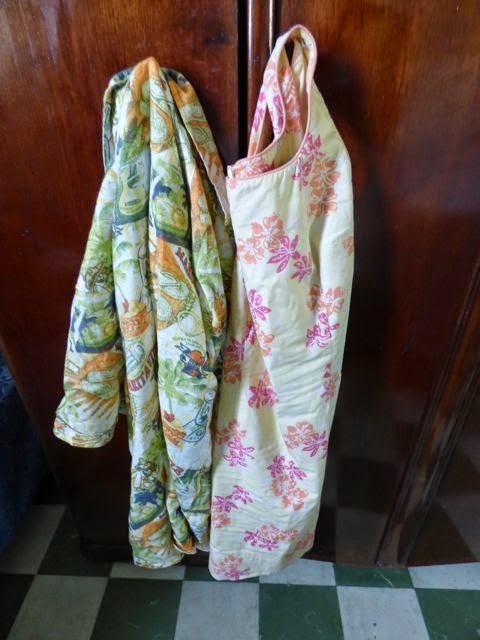 Ringing in the New Year in Havana prompted a rarity for us – spending a night off our boat. Cuba uses two parallel currencies. In theory, US dollars were not accepted anywhere in Cuba, and ATMs there would not accept US debit or credit cards. In fact, it is illegal for US citizens to spend money in Cuba. Our guidebooks advised bringing Euros as the best currency to bring to Cuba, so before we left Jacksonville Florida, we purchased some “walking around” cash through a local bank. Even if we didn’t stop in Cuba, Euros were viable in the South Pacific French territories. 4 people deep through the aisle, end to end. In a land ruled by rules, often the contrary approach is the more efficient one. 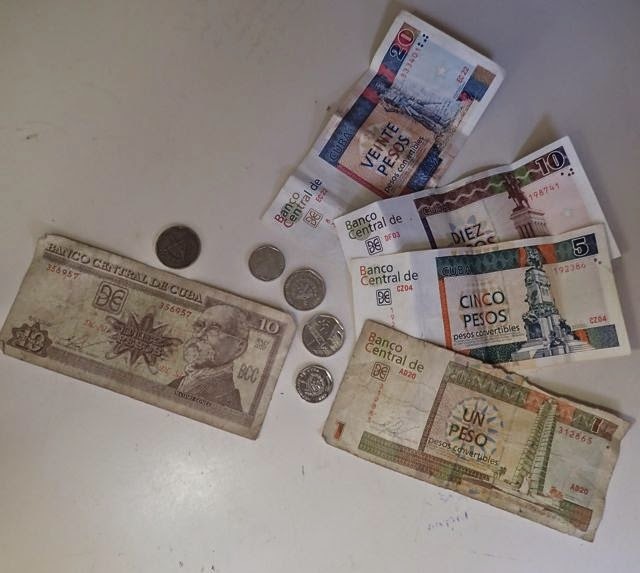 Our Mariel Hemingway neighbors aboard Christina found it no problemo to get a prompt exchange from US dollars to Cuban CUCs, the currency visitors were expected to use in Cuba. The exchange rate was less attractive than Euros, though “Gorilla” – a local, unofficial money changer -- gave a better exchange rate than the local hotel. We tromped off to the adjacent town of Santa Fe, in search of the closest cardena, the officially correct place to acquire currency conversion. We didn’t find it. his wife, who wondered what the heck took him so long. The next day ”Gorilla” exchanged 20 Euros for 20 CUCs and Walter on Christina insisted on loaning us some more to get us on our way. Sailors are restricted entering Havana by boat; they are required to check in at designated marinas Mariel Hemingway was the closest to Havana and not quite in walking distance of it. 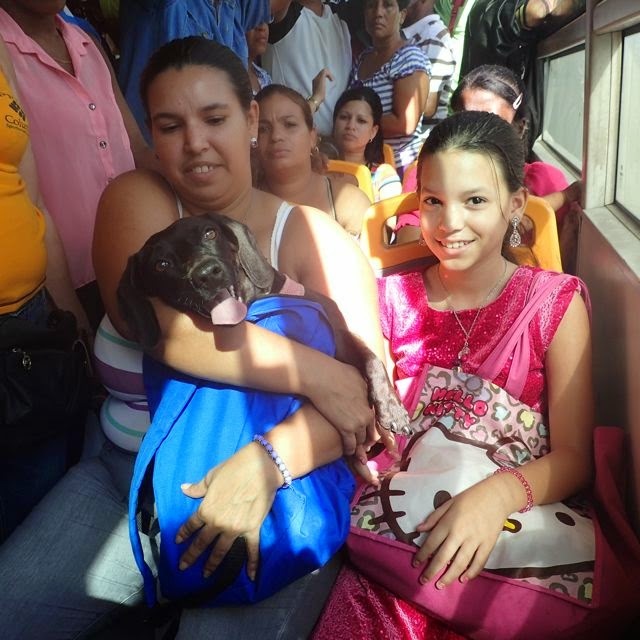 Thus, we further initially bumbled our way through Cuba’s excellent local bus system. We are both notoriously cheap and perversely enjoy the experience of everyday local bus transportation (>$1/person – if you have the correct change) over the costly convenience of a cab ($20-25 to Havana). The novelty of riding in a 50s Chevy was tempting, but we opted for low budget. 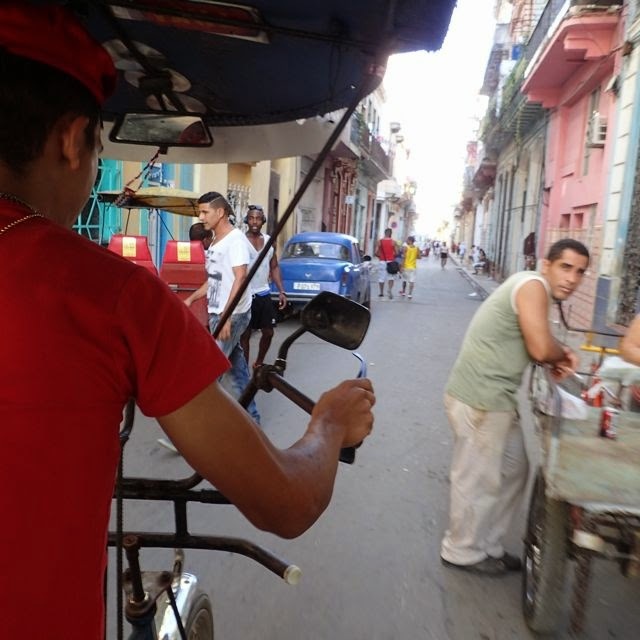 Pauli the pedicab driver, careening down the streets of Havana. We were hot, hungry and unsure of how to find an available casa de particular – a room inside a local resident’s apartment. 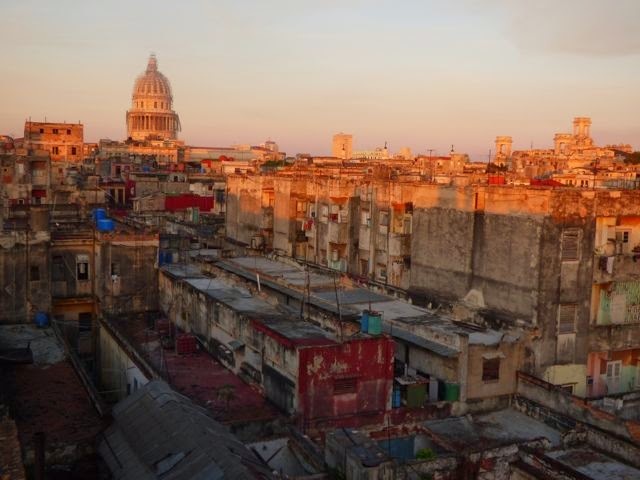 Hotel rooms, which from our perspective isolate us from the locals, start at ~$100/night in Havana. Casa de particulars start at $20. Sure, I wrote down the addresses of several casa de particulars, however it was already after 3 pm and we didn’t have a street map so eventually yielded to a pedicab. 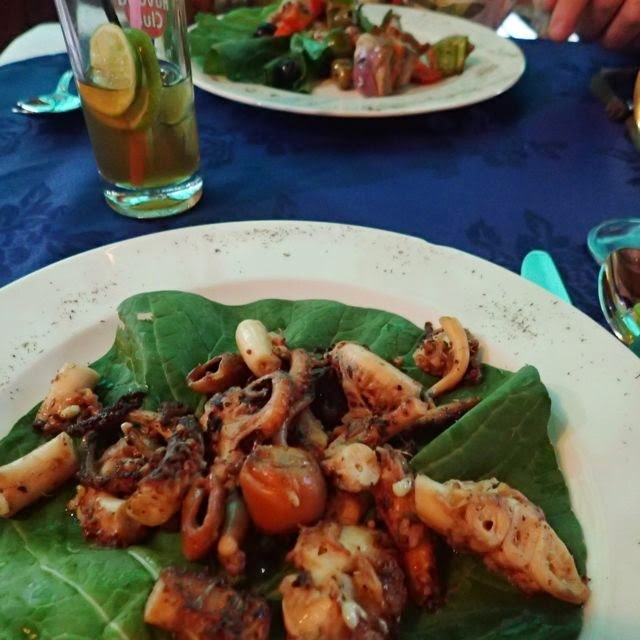 New Year's eve dinner of "la pulpa" - octopus, in a garlic sauce. so on those rate occasions, I make sure it's very well made. On the side, the best mojito I've had to date. Pauli, our young driver spoke little English, and Wayne speaks a little “muy malo” Spanish. Later, when we hit other communication roadblocks, Pauli pulled out the translation app on his mobile. “Type in English,” he directed. Meanwhile, Pauli took a look at the addresses and began pedaling. “No reservation? On New Year’s Eve? No intelligencia!” he joked, pointing to his head and shaking it, to drive the point home. About an hour later after encountering about 10 no vacancies, Pauli entreated one of the casa de particular owners from her third story balcony to help us via telephone find one with a vacancy, while Pauli did the same. We noticed her concluding several phone calls with a negative shake of her head. 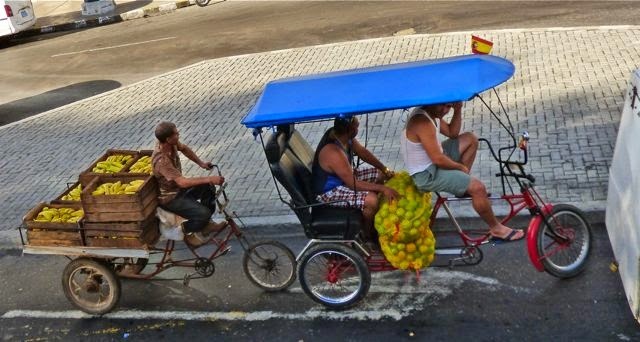 transporting produce. Yes, Cuba have cars, buses and trucks, too. At last, excitedly, that one last “Just one more,” did indeed lead us to a place to stay. It only recently became a casa de particular and had not yet posted its sign on the street. Pauli waited to make sure we were ok with the casa de particular; he was not familiar with the host or the unit. Once we checked in, we asked Pauli to take us where he most enjoyed eating. Jose Marti Theater Havana Cuba, New Year's Eve. All that and his rate was still only $5. Wayne paid him $15. We also collected his mobile email address and promised to send him the photo I took of him and his wife, who anxiously appeared while Pauli waited for us outside the casa de particular. Seems she was ready to celebrate too, while Pauli found it hard to pass up work when it came his way. Hot, tired, and hungry we were happy we landed where we were and even how we did. It’s all part of the adventure. 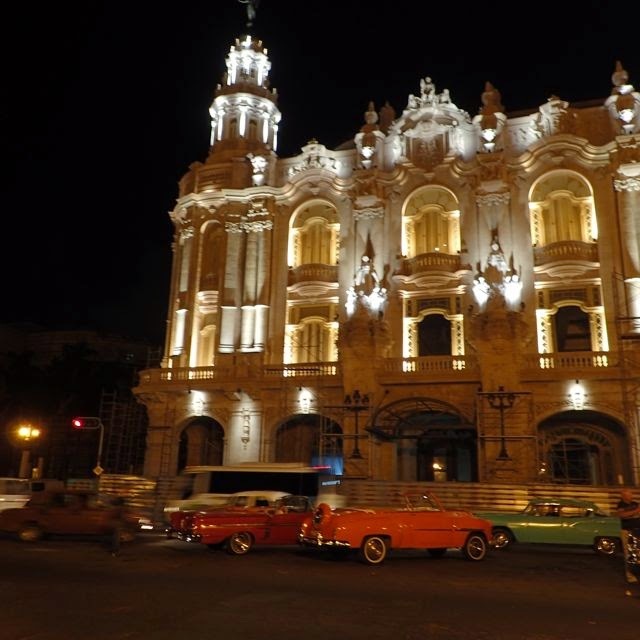 What else did we do to celebrate New Year’s Eve in Habana Cuba? That’s the next blog post. CUBA retrospective of December 31, 2014, New Year’s eve. At the time, our boat was docked at Muriel Hemingway Marina, (N23.05.231 W82.29.972) CUBA. We are currently in Panama's Bocas del Toro region (guessing near N09.20.142 W82.40.718 when this posts -- it was prescheduled). Eventually we'll pass through the Panama canal from the Atlantic to the Pacific, for our South Pacific adventure. I love cruising, though miss my Stateside friends and family and most cruisers from the last 2 years we befriended aren't on our track for the next two years. Now that we're in Panama, we're meeting more cruisers we'll likely re-encounter. Betting some will become new friends. Grateful for staying connected via Facebook, the blog etc. Wishing you sunshine, excellent crafting and much fun.